Using a thorough and comprehensive workbook format that is action-focused and easy-to-understand, this book guides readers through the entrepreneurial journey from concept to validation to commercialization to exit. 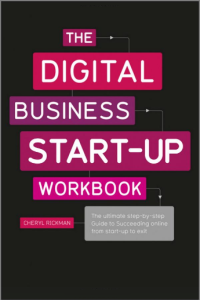 It uses practical exercises to walk the reader through each step of the start-up process and includes advice from some of the most successful and well-known digital entrepreneurs. Online extras like downloadable templates, exercises, and tips offer further resources for entrepreneurs, current business owners, and brick-and-mortar business owners who want to expand maximize their online presence. [ ] Write your business plan, action plan, marketing plan, and exit plan. [ ] Outline sources of finance, what you need the money for, and how much equity you are prepared to give away. [ ] Design and develop a content-rich search engine friendly website. [ ] Put a web analytics and monitoring solution in place. [ ] Create a content strategy. [ ] Write clickable and readable web copy. [ ] Contact, compare and choose suppliers, payment providers, and order fullfillment processes. [ ] Optimize your site for mobile and web across multiple platforms, operating systems and browsers. [ ] Outline which skills, knowledge, industry contacts, experience are missing from your team that you'll need to recruit. [ ] Establish how you'll retain staff through motivation, environment, communication and culture. [ ] Define your brand identity, summarize your promise and write a slogan. [ ] Consider how you'll spark curiosity prior to launch and from then on. [ ] List our creative ideas about brand ambassadors. [ ] Find out what social mediums your audience is using and evaluate the content, topics and formats they are interacting with. [ ] Create relevant marketing messages. [ ] Set up social media profiles which reveal that value. [ ] Recruit a fleet of influencers who can create a buzz. [ ] List potential partners and collaborators. [ ] Put in place methods to enable your customers to promote your products and services for you. [ ] Createa top-notch customer service plan. [ ] Establish ways to store and protect your and your customers data. [ ] Put together a strong management team with scalable technology. [ ] Learn from your mistakes, work hard, persist and believe. The complete checklist can be found in the book. Click here for more information.